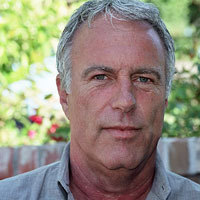 Bill Rose is a Northern California based documentary filmmaker. This Dust of Words is Rose's second feature documentary to air on KQED. His first, The Loss of Nameless Things, which is based on the life of brain-injured playwright Oakley Hall III, has screened at nearly thirty film festivals, won multiple Best Documentary awards, and been broadcast nationally on the PBS series Independent Lens. Rose lives in the Bay Area with his wife and children.